Automatic file transfer software allows users to program when files should move between internal systems, users, or trading partners. This software is often used to manage reoccurring or high-volume file transfers, so other business-critical tasks can be prioritized and pursued. GoAnywhere MFT is a secure FTP automation software alternative that lets users quickly automate file transfers and schedule projects to run using its built-in scheduler or your existing scheduler software. Projects can also be automated, executing whenever a file monitor detects new, modified, or deleted files in targeted folders. Projects can be called from local and remote command lines, scripts, and programs using the provided commands and APIs. Projects can additionally be called as Web Services using SOAP or REST requests. To execute Projects based on user activity, triggers can monitor for events like when a file is uploaded or downloaded. 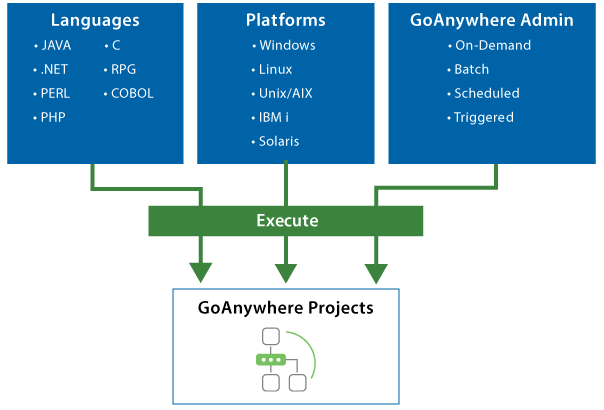 Within GoAnywhere's browser-based administrator, users can also achieve workflow and file automation by executing projects they're authorized to with a single click. Make automation easy with GoAnywhere's automatic file transfer software. Try a free 30-day trial. GoAnywhere MFT can execute multiple projects concurrently with its job management system. Administrators can define multiple job queues to group projects that share common characteristics or service level agreements (SLAs). Each job queue can define the priority of their jobs as well as the maximum number of concurrent jobs that can be executed from the queue. Job queues can be managed and prioritized through GoAnywhere's Administrator interface. Projects can be executed in Debug mode, which allows users to interactively execute tasks one step at a time. At each stopping point, the values for the variables can be viewed or changed before the next task is executed. Looking to automate your FTP transfers? With GoAnywhere MFT’s free license, you’ll be able to do just that with the FTP Client module. The free license also includes an FTP Server and 10 GoDrive users. The free license is perfect for small organizations who don’t exchange sensitive files or need to comply with data security regulations. Download the free license and you’ll receive email instructions on how to get started. Obtain a personalized quote for our secure FTP automation software. Pricing is based on the features you need.